Yesterday Wiggins Class had a visit from Caroline, our School Nurse. 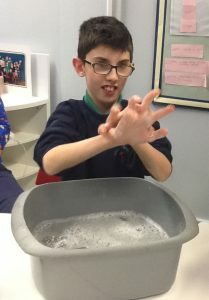 We have been thinking about keeping clean and often practise good hand washing skills especially when we have cooking lessons. 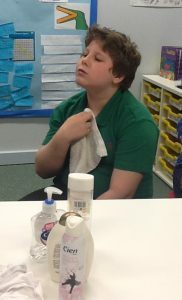 I invited Caroline to school to see what else we could learn about personal hygiene. 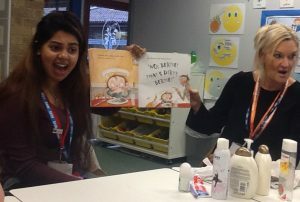 She brought a very funny, but a little bit disgusting, book which we enjoyed listening to and we were shown how to make sure we get all the germs off our hands by paying close attention to every part when we wash them. 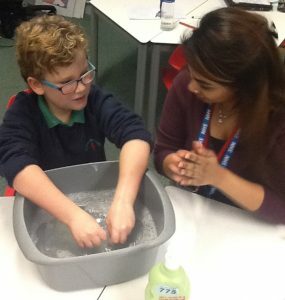 We were taught about how to wash ourselves in the bath or shower and to make sure we dry carefully. We are looking forward to next Wednesday and our second visit from Caroline.